,owing to the breathtaking views of towering mountains,with their white peaks beautifully contrasting with the greens,gold and browns of the valleys and meadows in between.One can breathe the fresh mountain air and indulge in the pleasures of this magical wonderland.Few popular destinations in Kashmir includes Srinagar,the state capital,Pahalgaum,gulmarg,and Sonmarg.you can enjoy the pale green paddy fields raised upon the hill, rushing,snow-fed streams in the high meadows and the encircling snow-capped mountains,which provide a perfect setting for a valley that’s vibrantly alive.
. We try to cover all the famous tourist destinations in kashmir like Srinagar, Sonmarg, Gulmarg, Pahalgam, Dal Lake, Kheer Bhawani, Manasbal Lake, Shankaracharya Temple, Yusmarg for your best kashmir honeymoon packages. We have wide network of kashir Budget Honeymoon Hotels in Srinagar and Luxury Houseboats in Kashmir so you can select the best accommodation in kashmir as per your style and budget. If your honeymoon budget is too low then we offer some cheap honeymoon packages for kashmir with cheap hotels in srinagar. they leave satisfied and with great memories. We also have feedback section on our website customers put there feedbacks regarding there kashmir tours and experiences with us. are all scintillatingly charming that adorn different hues in every season. in the laps of nature. Spending few days in a houseboat are more enthralling than spending a week in the most luxurious hotel. But nothing compares to the adventure activities that you can indulge in . With snow capped mountains, fast flowing rivers, this is a world beyond imagination. Here, apart from taking the toughest treks, you can also indulge in river rafting which is really a mind-blowing experience. is also one of the most visited Pilgrimage State in India. Pilgrims throng to state to visit few of the holiest Hindu shrines Amarnath Cave and one of the sacred most shrine for Muslims, Hazaratbal. When one is talking about pilgrimage in Jammu & Kashmir, the famous Hari Parbat has to be mentioned. It is the place where a mosque, a temple and a gurudwara stand side by side portraying the harmony and brotherhood among the people of different religion in the state. , which since then has become a legend. "The place is more beautiful than the heaven and is the benefactor of supreme bliss and happiness. It seems to me that I am taking a bath in the lake of nectar here. "After reading these lines, no one should be left with any doubt about the fact that Kashmir is the most beautiful place in the world.Kashmir is the only region of India to have a historical record of its distant past. Such is not the case with the other parts of India which led to the 11th century, the Islamic scholar Alberuni to remark that Indians lack a sense of history. According to a legend, the great sage Kashyap drained a lake and the Brahmins then inhabited it. The place came to be known as Kashmir. A land of turbulent past and present, the missionaries of Emperor Ashoka introduced the Buddhism in the region. The religion flourished under the rule of Kushan in 2nd Century. However, Hinduism continued to be the dominant religion of the region for many centuries. In the 7th Century, Durlabhavarrdhana founded the Karkota dynasty, which was replaced by Utpalas in 855 AD, which were succeeded by the Tantrins, Yaskaras, Guptas abd Loharas ruled respectively. The first Muslim who reigned Kashmir was Shams-ud-Din who replaced the last Hindu king, Udiana Deva in 1346. Moghul emperor Akbar conquered it in 1586 and thus Kashmir became a part of his vast empire. 1757 saw the victory of Ahmed Shah Durrani and Kashmir went out to Pakistan until 1819, when Ranjit Singh won it again to annex it to his Sikh empire. In 1846, the British defeated the Sikhs and sold it to Ghulab Singh of Jammu for Rs 7.5 million under the Treaty of Amritsar and gave him the status of an independent princely ruler of Kashmir. He conquered Ladakh and added it to his dominion. Maharaja Ghulab Singh died in 1857 and was succeeded by Maharaja Rambir Singh. Maharaja Partab Singh and Maharaja Hari Singh ruled over Kashmir in succession. The India-Pakistan partition took place during the reign of Hari Singh in 1947 and the rulers of princely states were given the choice to freely accede to either India or Pakistan or to remain independent. However, since the Maharaja of Kashmir was a Hindu, he chose to join India despite the majority of the Muslim population in his dominion. However, since then there have been controversies over the decision and Pakistan claims that the decision was partial and the region should be a part of its dominion. Gulmarg is well known for its amazing natural beauty and it is counted as one of the unique tourist destinations in the world. Gulmarg is surrounded by dense forest. This place is famous for its golf hikes and beautiful highland golf course. The natural beauty accompanied with clean fresh air and a beautiful environment highlights Gulmarg as a major tourist destination. The way to reach Sonmarg or the Meadow of the gold is from the sindh valley. This valley also shows more amazing facet in kashmir. Sonmarg is located at an altitude of around 2730 meters from the sea level; it has Snow Mountains as its backdrop against the sky. Raghunath Temple is dedicated to the Hindu Lord Shri Rama. All the inner walls of this temple are covered with gold, on three sides. Galleries of this temples are covered with ‘ Saligrams’. The other surrounding temples are related to other gods from the Ramayana. This temple is located in the centre or we can say in the heart of Jammu. Bahu fort was modified and improved by Dogra Rulers of Jammu but first it was built by the Raja Bahulochan. This fort is located at a distance of around 5 km from the main city and perhaps is the oldest edifice in the Jammu. This fort is facing the Tawi River. There is a temple of goddess kali in the fort. Mubarak Palace was built with the touch of three different styles, Rajasthani, Mughal and Gothic. Most famous part of this Palace is the Sheesh Mahal segment. There is a Dogra Art Museum, which is a treasure house of miniature paintings from various hill schools. This is one of the holy places for Muslim saints. Here, people from all the religions comes in large number to pray, on Thursday. Zanskar is located at a very high altitude in Jammu and Kashmir. It is one of the best trekking destinations around the world. In Winter, Zanskar river freezes up, and get converted into an amazing adventures trek called Chadar-The Frozen River Trek. Khillonmarg is another beautiful senic beauty and a favourate tourist destination . the famour liddar valley is promintnt feature . The traditional name for the Zanskar Trek is Chadar Trek as the river becomes a snow sheet during winters due to heavy snowfall. It boasts of some of the lowest temperatures making it a challenging trek for the adventurers. The most isolated and inaccessible for nearly eight months in a year due to heavy snowfall resulting in closure of all the access passes; Zanskar has the distinction of being the least interfered with microcosms of Ladakh, and thus one of the last few surviving cultural satellites of Tibet. This geographical isolation together with the esoteric nature of Buddhism practiced here has enabled its ten thousand inhabitants to preserve and perpetuate their cultural identity. Skiing is popular in Gulmarg, showing cable car in a snow clad mountain. Vernag Spring and Mughal Garden- A fresh water spring and a Mughal garden next to it, spring is chief source of Jhelum River. Dal lake - famous lake in Srinagar, with house boats called shikharas. Pari Mahal- old monument of Pari Mahal, one can have full view of Dal Lake. Hari Parbat- Ancient Temple of Goddess Sharika Bhagwati and an old fort on this hill. Gulmarg - Popular hill station and skiing destination. Betaab Valley- A lush green valley 15km from Pahalgam where the movie Betaab was shot. Amarnath temple - pilgrimage site for Hindu devotees of Shiva. Eco-tourism places :Gurez, Dudhpathri, Bangus valley. Ladakh, the region of mountain passes, a piece of broken moon land- a perfect place to witness the unmatched beauty of nature. Ladakh is the highest plateau of the Indian state of Kashmir with much of it being over 3,000m. It lies between 32 to 36 degree north latitude and 75 to 80 degree east longitude. The total area of 45110sq km makes Ladakh the largest district in India. Ladakh region is bifurcated in Kargil and Leh districts. Kargil lies at an altitude of 2750m and Leh at 3505m. The largest town in Ladakh is Leh. Ladakh is renowned for its remote mountain beauty and culture. It spans the Great Himalayan and Karakoram mountain ranges and the upper Indus River Valley. The district bordered Pakistan occupied Kashmir in the west and China in the north and Eastern part and Lahul Spiti of Himachal Pradesh in the South east. Ladakh's ethnic composition consisted of Mongoloid and a mixed Indo-Aryan population of Mons and Dards. It is sometimes called little Tibet due to strong cultural and geographical similarities with Tibet. The approach to Ladakh is invariably marked with many long walls running 2-3 kms, decorated with engraved stones bearing the mantra aÅ“Om Mani Padme Huna and Chortens which symbolizes Buddha's mind. Ladakh is a high altitude desert as the Himalayas create a rain shadow thus prohibiting the entry of monsoon clouds. The main source of water here remains the winter snowfall on the mountains that forms the glaciers. Like in the rest of the parts of the country where people pray for rain, here Ladakhis pray for the glaciers or snows to melt for irrigation and drinking purposes. Surprisingly though, the thin air makes the heat of the sun even more intense than at lower altitudes. Only in Ladakh can a man sitting in the sun with his feet in the shade suffer from sunstroke n frostbite at the same time. The summer temp. is quite pleasant but in winter it touches the extreme. The winter temp touches as low as minus 30 degree (Leh & Kargil) and minus 60 degree in Drass. Subzero temp prevails from December to February throughout Ladakh, whereas, zero degree temp is experienced during rest of winter months. This results in freezing of all conceivable water resources. During summer the maximum temp rises from 20 to 35 degree Celsius in July and August. Leh-Deskit (Nubra Valley) 118 Kms. Indian Airlines www.indian-airlines.nic.in operates 3 flight in a week between Leh and Delhi, 2 flights in a week from Jammu and once in a week from Srinagar. Jet Airways www.jetairways.com also operates six flights in a week between Leh-Delhi and Kingfisher Airlines www.flykingfisher.com operates daily flight Between Leh-Delhi. The cheapest way to travel within the region is by public buses, which ply on fixed routes according to fixed time schedules. The most comfortable and convenient though expensive mode of travel, however, is by taxi, which are available for hire on fixed point-to-point tariff. For visits to the newly opened areas of Nubra, Dah-Hanu, Tsomoriri, Tsokar and Pangong Lakes it is mandatory to engage the services of a registered/recognized travel agency for making all the requisite arrangements including internal transport. Detailed information about bus schedules, taxi tariff, travel agencies can be obtained from the Tourist Office or Local travels guide "Reach Ladakh", available at Book Shops. There cannot be a more beautiful destination than Kashmir for romantic honeymoon. Kashmir, popularly called as 'Paradise in India', is perfect place to start your new life in the blissful company of each other, in anticipation of what the future holds for them and to plan for fulfillment of all the big and small dreams. so that couples from around the world can enjoy there lives here. we offer cheapest honeymoon packages in kashmirwith diffenent tour duration . 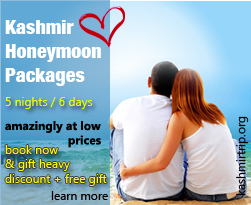 cheapest honeymoon packages in kashmir is valid in both winters and summers. , Explore kashmir the land where myriad holiday ideas take shape. We specialise in all type of kashmir tours, if you have and idea of how your trip should be please tell us we will give you expert advice for the same.